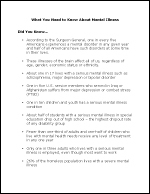 16 startling facts about mental illness. 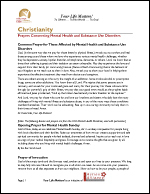 The Chicago Archdiocese Commission on Mental Illness has put together a helpful tool that includes 16 specific actions faith communities can do during Mental Health Month…or any time of the year. Thanks for sharing the Good News! Whenever we speak openly and honestly about mental health, we lessen the stigma surrounding it and beckon people into the wholeness of New Life in Christ. 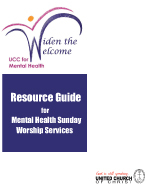 By celebrating Mental Health Sunday as a church, you participate in this important, life-giving Gospel work. 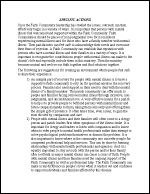 Prayers concerning mental health and substance use disorders, including a common prayer, opening prayer for Mental Health Sunday, a prayer of invocation, three pastoral prayers, a litany of naming, and prayers of the people. 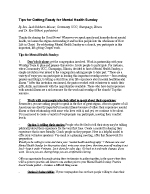 This document is offered by Your Life Matters!, an initiative of the Action Alliance for Suicide Prevention. Did you know... The magnitude of mental illness in this country is staggering. According to the Surgeon General, one in every five Americans experiences a mental disorder in any given year and half of all Americans have such disorders at some time in their lives. These illnesses of the brain affect all of us, regardless of age, gender, economic status or ethnicity. Our youth are our future. 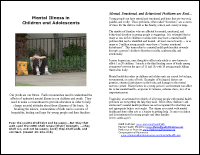 Faith communities need to understand the affects of untreated mental illness in our children and youth. They need to make a commitment to provide education in order to help change societal attitudes about these illnesses of the brain. In breaking the silence, communities of faith can be a source of hospitality, healing and hope for young people and their families. The first week of May focuses on children and youth. 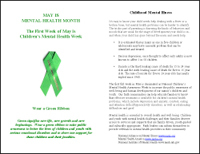 Children’s Mental Health Week is a bulletin insert/flyer using the green ribbon symbol. 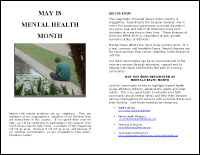 The National Catholic Partnership on Disibility offers a host of resources designed for May is Mental Health Month: prayers, patron saint information, bulletin articles, Welcomed and Valued resource manual and DVD, Work of the Network, Community Resources and National Agencies, and personal stories. 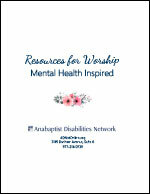 The Anabaptist Mental Illness Network offers some resources to help plan a Mental Health Sunday in which worship is inspired by the experiences of people living with a mental illness. It is a way to educate through the communication of compassion, understanding and acceptance.